One has to ask themselves: "How can a computer determine the value of a home that it has never walked through and seen the finishes of, in comparison to the other homes that have sold in the area?" 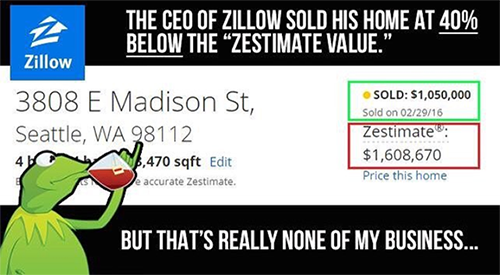 The Zestimate (and other, similar price estimates) are based solely on a computer algorithm that culls data from Zillow's listing information. This algorithm is purely mathematical and is utilizing what is often incomplete or erroneous information. Once these portals have pulled information from the MLS, they will often fail to update listings with revised pricing information. In some cases, they never update the listing's status from "available" to "under contract" or "sold" - and there's a good business reason for this (though it's easy to write off as an oversight or "software glitch"). What many consumers are not aware of is that Zillow (and other consumer portals) make money from users who are inquiring about properties listed on the website. The companies are selling that user's information to the agents serving that area code who subscribe to the service, every time a user submits a request for information about a property. So an estimate of value is not only just based on the numbers, but numbers that may not be completely accurate. Even in the event that it takes a few days for the site to update its price information, it can completely invalidate that property as a comparable. I answer inquiries from many buyers regarding listings they find on Zillow and other sites, who are not aware that the property is under contract...because the site has not updated its status since originally pulling the information down from the MLS. It's certainly possible this is a glitch...but the fact that they profit from it is enough to raise suspicions. Particularly in light of the fact that the company has just announced that it is getting into the fixing and flipping business (an announcement that caused the company's stock to tumble almost 10%). Manipulating the perception of a property's value could certainly work to their advantage, in that situation. When doing a comparative market analysis (CMA) for a property, I will frequently check to see what the major consumer portals (Zillow, Realtor.com) are showing as a value estimate, just to prepare for what a seller may believe their home is worth. The estimates are almost always way off...sometimes by 10-15% in either direction! I have also observed what the Zestimate does on my own listings, after they update their information from my MLS entry. The portals always adjust the estimate right after my new information is updated, based on my asking price...which they've never gotten right. A cursory Google search reveals ample explanations for why the Zestimate is unreliable and shouldn't be trusted...and in the Denver market, Zillow finds their estimate within 5% of the sale price only 65% of the time. They are within 20% of the sale price 94.5% of the time (see Zillow's FAQ entry: How Accurate is Zillow's Zestimate?). Is a 20% margin of error compelling to you, as a potential seller? And how far off are they, that remaining 5.5% of the time? Paying for an appraisal by a licensed and reputable real estate appraiser can sometimes be a good idea, before listing your home...it will help ensure that you aren't faced with a sizeable appraisal gap, when an eager and competitive buyer offers far above the asking price, but doesn't offer cash to cover the entire gap that will likely present itself. Having this information gives the seller a negotiating advantage and can protect them from these issues, after accepting an offer and going under contract. Short of an appraisal, though, a comparative market analysis by a Realtor is your best way of identifying the most likely sale price, given your area, your home's unique features, and the current market conditions. The moral of the story is: Trust a licensed Realtor with their abundance of nuance and skill to establish a sale price for your home...not a computer algorithm.